If you haven’t read part 1 and part 2, then maximize the slides below and go through those first. Now if we go back to our original example, the bouncer at the bar needs to ask you a few questions before they let you in or send you away. The first one of these was your age. If you were over 21, you could be let in immediately. If not, they would ask for your gender and maybe let you in. But there was no need to ask for both questions right away, just on a need to know basis. How can we model this in a graph? All it does really is call decisionPath which is shown below. It creates a new Expander and Evaluator using the facts that were passed in. Unlike before where we had one Evaluator for the entire procedure, now we need a new one for every query since it uses the facts to decide valid paths. If we reach an Answer node, our traversal is done. If we reach a Parameter node, we check to see if we have this fact. If we have it, we don’t include this path, but if we don’t have it then we are missing a parameter and need the user to answer it. // If we get to an Answer then stop traversing, we found a valid path. // If we get to a Parameter, check if its missing in our facts, if so we found a valid path. In our expander, we first check to see if we have rules to evaluate. If we get to a Rule, we have a fork in the road. 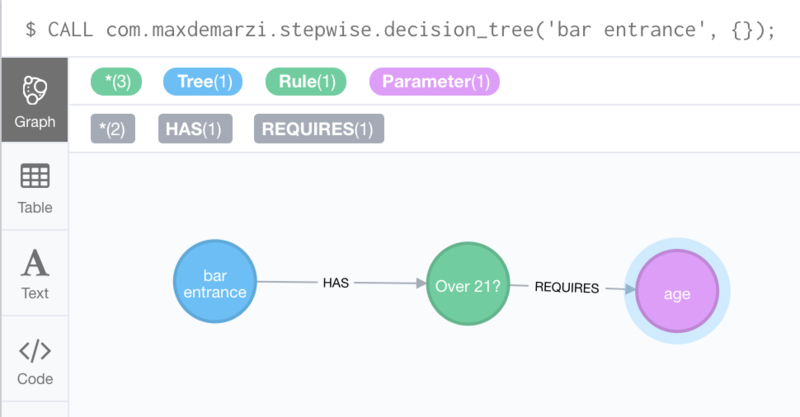 In Part 1 of the series I showed you how to deal with a standard decision tree which has only two outcomes, True or False. In Part 2 of the series we looked at dealing with multiple choice outcomes as with a decision stream. This expander is dealing with both. If for some reason though it is not able to evaluate the expression or script (because they were missing or let’s say somebody forgot to validate the parameters before passing them in), it follows the REQUIRES relationship to the Parameter node. // Otherwise, not sure what to do really. Our trueOrFalse method returns a RelationshipType. We are looking for IS_TRUE or IS_FALSE. We perform the same magic as before and cook our expression then convert the boolean result to an uppercase string to build what we need. Yes, it’s a little hacky, but it’s nice. // And now we "cook" (scan, parse, compile and load) the expression. // And now we "cook" (scan, parse, compile and load) the script. We will use the same idea when validating a parameter to see if it’s valid or not in the isValid method (not shown for brevity). Let’s give it a whirl by building the tree using Cypher. If your gender is not “male” or “female”, apologies, but you are not getting into the bar unless you are at least 21. …and we’re in the Bar! If you want to give it a whirl, the code is on github. For these kind of problems , isn’t it better to go with RETE network? 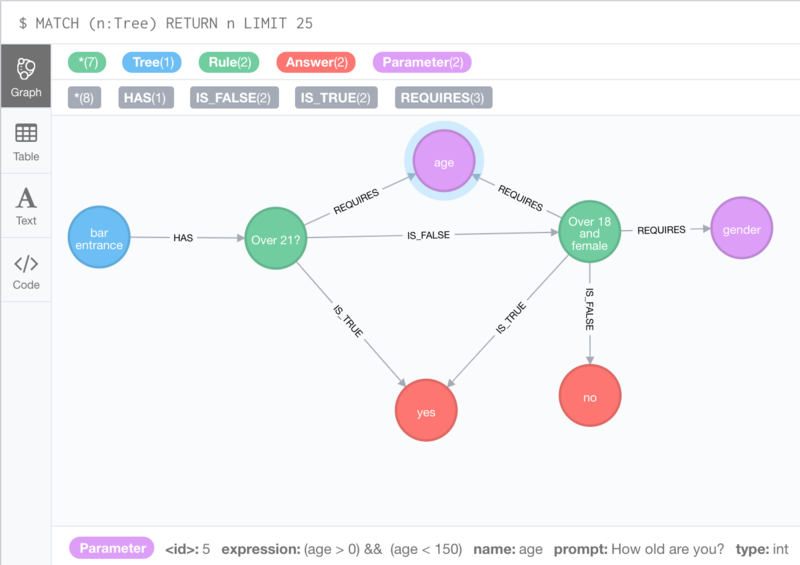 Have you done anything similar to maintaining a RETE net in neo4j?